Inspired by his friendship with Nicolas Poussin, whom he met in Rome in 1623, Jacques Stella became one of the foremost practitioners of the French classical style in painting. The present work demonstrates the impact that Italian art had on his work, following his sojourn to Florence in 1616-22. During that formative stage of his development, he was employed by Cosimo II de Medici, and encouraged to produce jewel-like paintings, following in the Florentine tradition, that were executed in a highly polished manner on marble, slate, lapis lazuli, or copper supports. He continued to work in this style, producing small precious paintings both in Rome and in Paris following his return to France in 1635 when he entered the service of the Cardinal de Richelieu. He was decorated with the Ordre de Saint-Michel, a great honor for a painter, and awarded the title Peintre du Roi which was accompanied by a rich pension and an appartment in the Louvre. The present painting owes as much to the influence of Raphael as to French Classicism (see, for instance, The Madonna of Foligno, the Vatican Museums, Rome). Its carefully finished, refined style was enormously popular in Stella's lifetime. 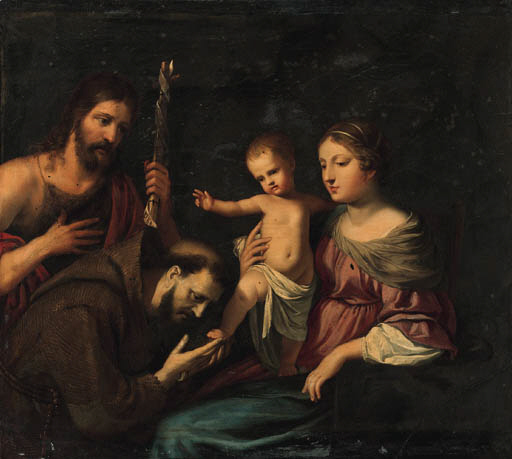 It is extremely close in execution to his signed Holy Family, also painted on slate, which was acquired by the Cherbourg Museum from an old Lyonnais collection (see G. Chomer, Jacques Stella 'pictor Lugdunensis', Revue de l'Art, 47, 1980, p. 88, fig. 9), and can further be compared to the Holy Family of circa 1630 sold at Sotheby's, London, July 5, 1984, lot 387 (£18,000 = $24,000). In a Louis XIV carved giltwood frame.